Wow. 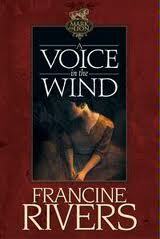 I just finished reading the 3 book Mark of the Lion Series by Francine Rivers. I think I am about 10 years behind the times on learning about these books, but I am so glad I finally picked the first book off my night stand and read it (it’s been sitting there for 3 years!)! I could not put it down. Literally. I read the first book in 2 days and the second book in less than 24 hours! Needless to say, the laundry and the house work got neglected but my heart fed. They are fictional books…a love story…but the truth of Jesus is woven throughout the entire story. Even though it is fictional book, the Truth in the story really challenged me spiritually. I wasn’t expecting that when I began reading! So, if you have time (or even if you don’t) and need a good book, check out the Mark of the Lion series (especially the first two books: Voice in the Wind and Echo in the Darkness). I hope you love them as much as I have! I’ve read them twice and love them as well. My heart’s desire is to be a Hadessah. How in the world did you make time to read one of those books in two days with 3 little ones? I LOVED those books! I read them years ago, and now I am wanting to go back and re-read them all!!! Wow! I’m impressed! I loved those books as well, but it took me much longer to read them. I’m a slow reader! I love anything by Francine Rivers! Have you read Karen Kingsbury?? I can read one of her books in a day or so. I LOVE her, and she is writing new ones all of the time. Are you coming to Created for Care in January? I enjoyed getting to meet you there las year! Ha! I even told Bryson I was going to read them aloud to him!! YES!! Reading those books seriously deepened my faith… I never thought that I would ask God to give me faith like a character in a random fictional book. lol. I recently read one of Francine Rivers’ new books and it honestly doesn’t even compare. 😥 I would recommend you my all-time favorite book above all books, Tramp for the Lord… but I know that you’re already well aware of it. 🙂 “Choosing to See” by Mary Beth Chapman was an incredible incredible book- it will definitely make you cry- but it was well worth it. I read this post a while back and checked the first book out at the library. Unbelievably good! I’m on the third book now. These books have deepened my faith and changed me. Thank you for sharing. BTW I’m Doug Hunt’s wife…Shelley.